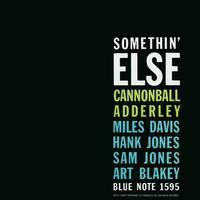 When Cannonball Adderley scheduled the 1958 recording of what was to be his only Blue Note LP, he called on his old employer from their days as quintet members on Columbia, Miles Davis. The reunion resulted in one of the greatest and most revered jazz LPs ever: Somethin' Else. The quintet delivers beautiful renditions of "Autumn Leaves," "Love For Sale," "One For Daddy-O," "Dancing In The Dark" and the title tune.